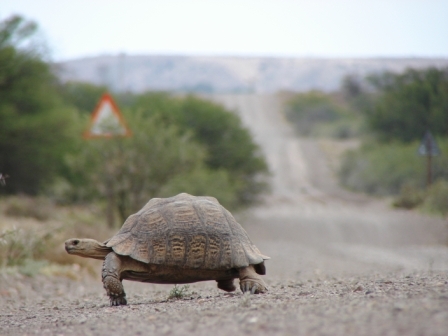 “Slow and steady wins the race” isn’t exactly Paul’s point in Philippians 3:12-16. In fact, it’s not close at all. But the hare is a good example of what Paul tells us not to do: “Not that I have already obtained this or am already perfect . . . But one thing I do: forgetting what lies behind and straining forward to what lies ahead, I press on toward the goal for the prize of the upward call of God in Christ Jesus” (3:12-14). You can’t win the race by acting as though you’ve already crossed the finish line when there’s still a lap to go. That’s just foolish. Neither can you win by not pressing hard (which is where the tortoise and hare analogy falls short). For Paul, the race is the singular passion he described in 3:10-11: to know Christ by walking in the power of his resurrection and following the pattern of his sufferings, with a view to sharing in the future resurrection at his return (cf. 3:20-21). This is “the upward call of God in Christ Jesus” that he mentions in v. 14. But finishing this race requires both a gospel-shaped humility and a gospel-fueled passion and perseverance. When it comes to pursuing a deepening and vibrant relationship with Christ, there is an ongoing temptation to think so highly of ourselves and so little of our sin that we’ve already arrived and have nothing further to learn or gain. Gospel-shaped humility takes a good look at our sin and then a good look at the cross and reminds us of the obvious: we still have a long ways to go (and will until the Lord returns). Paul wants to make sure that no one mistakes him for claiming to have achieved some spiritual perfection—he disavows it twice (vv. 12, 13). But humility doesn’t mean we sit on our duff. We have been rescued for a purpose, and Paul models for us both a passion to know Christ and the perseverance necessary to keep running, even when it gets hard or the racetrack takes an unexpected turn. We need both passion and perseverance to stay the course and not give up—a passion and perseverance fueled by the gospel of Jesus. It’s equally tempting for us to think so lowly of the prize and so little of God’s grace and Spirit that we become disenchanted with the whole pursuit. We see our sin and we’re overwhelmed by our weakness and shame. Or perhaps our view of the prize is distorted by misplaced expectations or distracted by selfish desires, and we’re simply not convinced that the value of attaining it is worth the cost of pursuing it. But when we keep our eyes and hearts fixed on the gospel of Jesus and the news of what God has done to establish his kingdom and deal with our sin through the life, death, and resurrection of Christ, and when we see how we fit into that story—sinners saved by grace and set apart for joyful service—we become increasingly convinced that what Paul said about the prize of knowing Christ in 3:8 was utterly true: “I count everything as loss because of the surpassing worth of knowing Christ Jesus my Lord.” And when the compelling beauty of Christ is in place, our focus is sharpened and our faith emboldened to run the race of knowing Jesus with great joy and willing sacrifice, that we might know Christ and make him known among the nations (cf. Phil. 1:27-30). If you’re in the MetroWest suburbs of Boston, please consider joining us this Sunday (Jan. 29) at Westgate Church in Weston as we consider more fully what it looks like not just to walk with Christ, but to run with him all the way to the end.